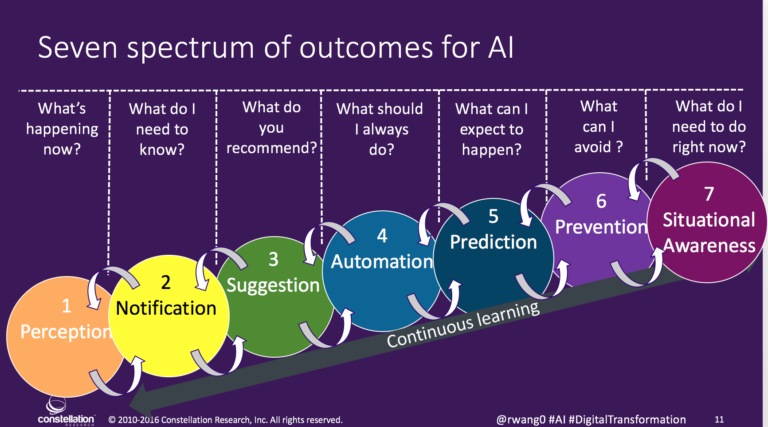 Successful AI projects seek a spectrum of outcomes, says R “Ray” Wang. AI driven smart services will power the future business models. As with most disruptive business models, form must follow function. Just enabling AI for AI’s sake will result in a waste of time. 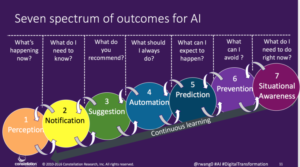 However, applying a spectrum of outcomes to transform the business models of AI powered organizations will indeed result in a disruptive business model and successful digital transformation. Perception describes what’s happening now. Notification tells you what you asked to know. Automation repeats what you always want. Prediction informs you what to expect. Prevention helps you avoid bad outcomes. Situational awareness tells you what you need to know right now.